Judicial investigation was conducted by Court No 3 of Tortosa, under the direction of the Public Prosecution Office for Environmental Issues of Tarragona, and with the active participation of CITES Authority in Spain. March, 08 2017, within the framework of an operation coordinated by EUROPOL and EUROJUST, and with the participation of Portugal, Italy, France, Greece and the United Kingdom, the Spanish Guardia Civil arrested 8 people in the towns of Tarragona, Seville and Valencia. 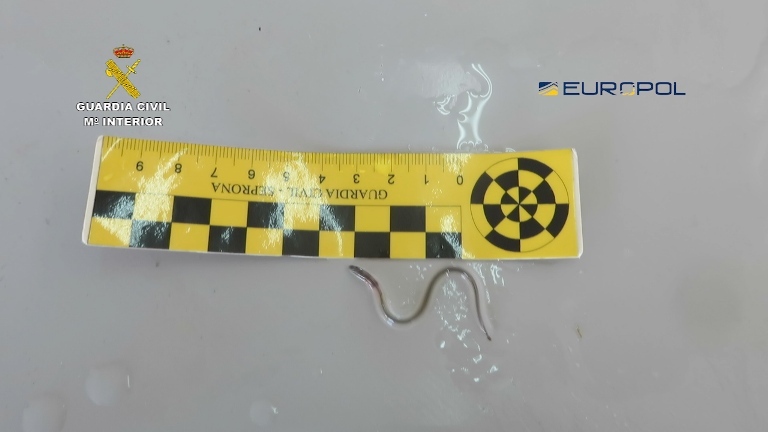 Apart from them, 9 people more had been arrested in Greece; they were members of an international organisation devoted to the illegal trade in elvers. The people under arrest were charged with the alleged offences of smuggling, falsification of documents, crimes against fauna and money laundering, all of them within the structure of a Criminal Organization. Among the people who were arrested in Spain, there are two Chinese nationals linked to the payment system known as “HAWALA”, “CHOP” or “FEI-CH’IEN”. 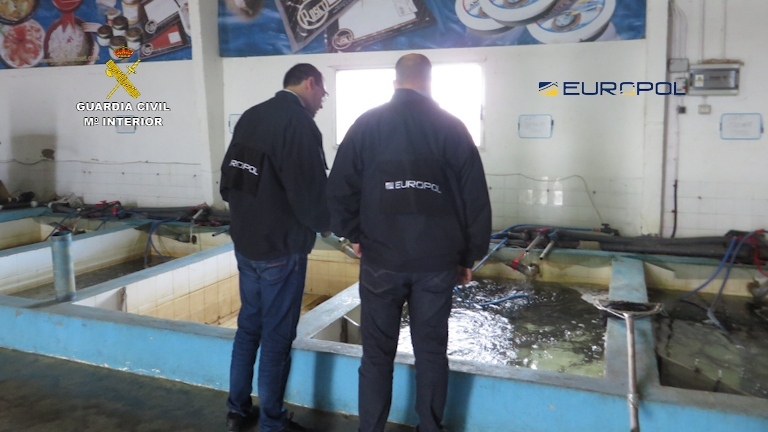 Thanks to this system, some of the money obtained from the sale of baby eels was sent to the organisation in cash from Hong Kong; this money was directly sent by Chinese nationals settled in Spain and with business in our country. This way, they were able to avoid international transfers of money, thus reducing commissions and escaping control by the competent tax and financial authorities. Likewise, approximately two tons of live animals have been seized, and 9 searches have been carried out in households and business premises in Spain where different items were seized such as IT equipment, documents about the illegal activity, luxury vehicles, over EUR 300,000 in cash and small gold ingots. 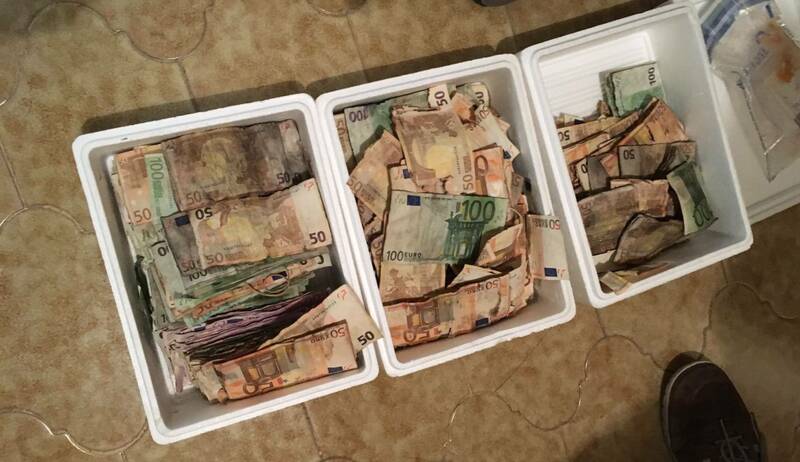 Apart from this amount, EUR 240,000 more were seized in a roadblock after some members of the network had met with the Chinese nationals arrested, who were responsible for sending the cash through the system already mentioned. 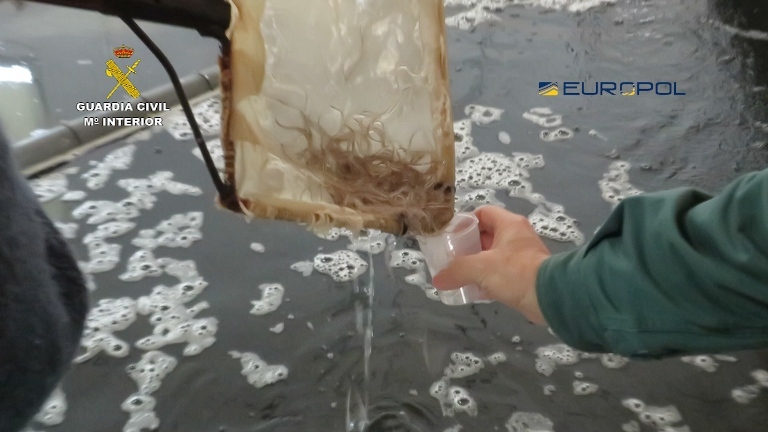 Operation ABAIA began last June, when some members of UCOMA – Environmental Protection Department of Guardia Civil (SEPRONA) found out that a company from Tarragona that traded in elvers might be also exporting them illegally. It should be noted that this company had been already investigated in 2012 (Operation SUCULENTA) for the same reason. Once the first steps were taken, Guardia Civil officers verified that this company might be still exporting baby eels (fingerling of the species Anguilla anguilla) using other EU countries to avoid detection. Thanks to the information collected by Guardia Civil, in July 2016 a meeting was held at the EUROPOL Headquarters in The Hague, where the tasks of every country concerned were defined. Once the information was collected, Guardia Civil found out that the Spanish company bought elvers fished both legally and illegally in the Spanish territory, but also bought other elvers to French, Portuguese and Italian nationals, being unable to assess whether baby eels had a legal or illegal origin. 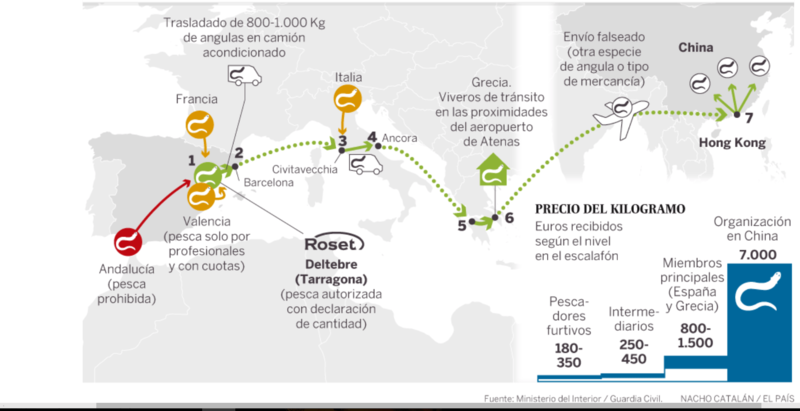 In order to illegally get elvers, they used poachers from the regions of Andalusia (Autonomous Region where it is totally forbidden to fish this species), Valencia (professionals are allowed to fish, with a catch declaration), or in the area of Ebro River (fishing is allowed, but catches must be compulsorily declared). After a specific quantity had been collected (between 800 and 1000 kilos) baby eels were transported to Greece in a lorry especially equipped to transport live fish. From Greece, and concealing the real content of the shipment, baby eels were sent to Hong Kong to be subsequently sold in China. These trips consisted of several stages. First, the lorry went from the company premises in Tarragona to the Port of Barcelona, where it embarked onto a ferry-boat towards Italy. After crossing the country by road, the lorry took another ferry-boat until the Greek coast. After that, elvers were kept in fish ponds near the airport of Athens. 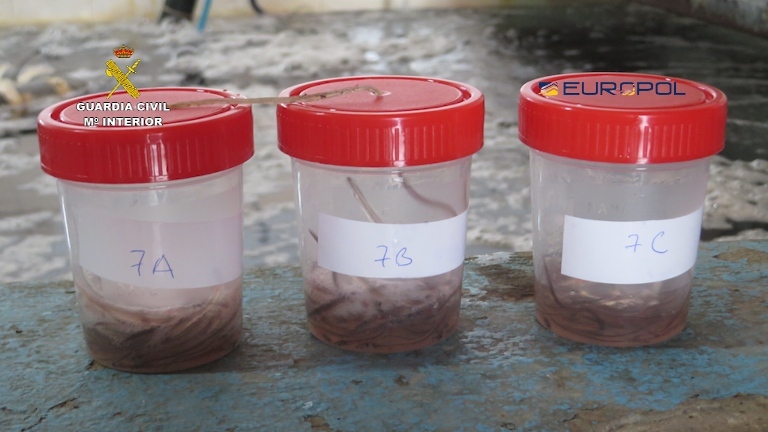 After some days in the ponds (a key step to reduce stress in baby eels), the organisation arranged the shipment by air to Hong Kong, either declaring the wrong type of elver in the export documents, or concealing the real nature of the goods. It is worth mentioning that since the company operated legitimately within the legal market of baby eels, it was easy for them to hide weird moves regarding their origin, thus making police work much harder. Because of that, Guardia Civil implemented a system to identify the persons in charge, the routes used to move the animals, formulae to evade official controls, etc. The investigation was coordinated with the other countries, especially with Greece, since the crime of smuggling was actually committed in that country, thus completing the criminal circle and supporting the rest. As a result of this investigation, it was proven that the Spanish company had designed a scheme to escape their criminal liabilities. To that end, and linked to well-known Greek businessmen, a web of bogus companies had been set up to send the shipments without raising suspicion. 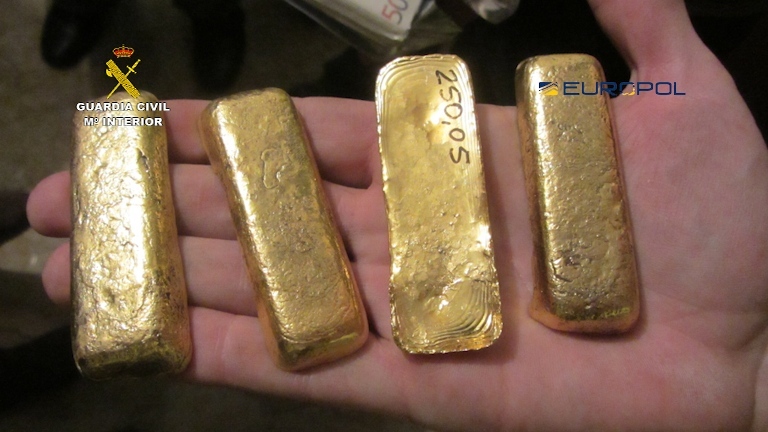 Besides, Guardia Civil officers confirmed that the higher the member was within the organisation, the higher the proceeds corresponding to every step in the organisation rose, according to the prices at every level: between 180 and 1,500 €/kg depending on the level. Nonetheless, most of the proceeds obtained from this activity would correspond to the branch of the organisation located in China; net profit obtained by this branch is considered to amount to over 7,000 €/kg. Species Anguilla anguilla, or European eel, is included in Appendix II of CITES Convention. This implies that it can be marketed, provided the relevant requirements are met and the corresponding permits are obtained. However, since the European Union considered that its inclusion in the aforementioned Appendix did not ensure the necessary level of protection, a “Zero quota” was established as far as international trade is concerned. Despite this fact, this prohibition does not apply to internal trade Europe-wide since the CITES Convention cannot be applied therein because there are no internal borders. In any case, sales in Europe are very low and they do not seem to have a negative impact on the survival of this species. Notwithstanding this, the final destination beyond our borders might imply the disappearance of European eels. The operation was supported and directed by the Public Prosecution Office for Environmental Issues of Tarragona, which subsequently referred the case to Magistrates´ Court No 3 of Tortosa (Tarragona). Likewise, the collaboration by the CITES Authority in Spain has been very remarkable, since they participated actively from the very beginning in almost every important action, and they even attended the meeting held at EUROPOL HQ.